The bright, spacious accommodation features one very large double/treble bedroom (King-sized bed), separated from a substantial shower room - (walk in rain-shower ) W.C, wash basin etc. The inner hall leads on to a good sized living room with a feature open fireplace, easy furniture and dining area. Our American style kitchen includes a full oven with hob, fridge/freezer, microwave, toaster, all cooking utensils and crockery. The FULLY AIR-CONDITIONED property is complete with towels, linen (changed weekly), electrical fans, hairdryer, steam iron etc., cleaning is provided between lets. There is a private walled garden with quiet shaded terrace, patio table and chairs, sun loungers, ( patio doors open to the garden from the lounge). The garden enjoys day-long sunshine! When it comes down to it, you deserve your own private space. Space to relax in your own lounge, on your private, sunny walled terrace where your children can play safely or, a short stroll to any of our three landscaped pool complexes - private to owners and their guests! Check out our two superb, secluded, semi-detached ‘Pueblo’ (village style) villas within this development of individually designed, charming, privately owned properties. Situated just above 'Burriana', Nerja's largest and most cosmopolitan blue-flag beach, our holiday homes are ideally situated for the sea and the town centre. On-site bars including the famous 'Cave Bar',A good on-site restaurant (with an extensive variety of other casual and fine-dining restaurants just a stroll away), three large, sparkling pools with safe and separate kiddies pools,free internet (WLAN) is available with 'hot-spots' both on-site and in any number of other local locations. WIFI on a pay-as-you-go basis can also be provided in the property - please be sure to ask for details prior to booking. Two well stocked pool-side bars, (open easter until the end of October), money-changing facilities, doctor, large supermarket and the most beautiful communal gardens in Nerja, make this the most desirable complex in town for a totally relaxing holiday in the sun. Our two bedroomed property is situated right alongside one of our pool complexes with safe and separate kiddies pool ( max age 6 years). Please be aware that the area does involve steps. Coast/Beach: Nerja and the surrounding area offer any number of beautiful beaches. There are separate beaches designated for naturists. The stunningly beautiful town of Nerja itself has grown over the years from a small coastal fishing village into the smart resort it now is. Nerja's development has been very carefully overseen in order to keep it special. Nerja with it's nine beaches is without the high rise skyline so very typical of the resorts further west. From the whitewashed narrow streets of the old quarter with it's tapas bars and front door fruit and vegetable stalls to modern hotels and high street brand name shops and a diverse choice of quality restaurants. Nerja embraces the very best of old and modern Spain. The flavour of Nerja is that of a sophisticated holiday town aimed at discerning travellers who want quality , choice and the unique experience of the real Spain. As with any Spanish town, Nerja is really 'child-friendly'. Skiing: Nerja is only one to one and a half hours by car away from the skiing resort of Sierra Nevada. There you will find everything you could ever want for skiing whatever your level of competance! A bus service to the ski slopes including the facility to hire equipment at discounted prices is organised in the season on a weekly basis by the town of Nerja. Golf, Walking and more: There are numerous golf courses in the immediate vicinity but, be aware that some courses may ask for details of your playing handicap if you are to use the course. Generally, the area is one of outstanding natural beauty with rolling hills against a backdrop of impressive mountains all around. Nerja is surrounded by the 'National Park of the Sierra Almijara and Axarquia'. Within easy walking distance are just so many picturesque well-documented walks suitable for walkers at all levels from the beginner to the most experienced. There are also any number of guided walks on offer or, why not consider an 'Adventure day out' - this involves 4x4 off-road driving coupled with walks led by an experienced guide (pic-nic lunch included), we have all the details you need. Off-road biking, conducted 'Mountain biking in the Axarquia', quad biking (helmets etc., provided) along with cycling, horse riding, snorkeling, jet-skiing and diving (PADI) , all readily available locally - your choice! Last, but by no means least, don't forget the famous tourist attraction which is the 'Caves of Nerja' - this the second most popular tourist attraction in all of Spain and really is a 'must-do attraction' ! The good sized (new for 2018) bathroom features a full, room width, walk-in rainfall combination shower, toilet, washbasin with a large L.E.D lit mirror. Fully tiled throughout in white, this is a top-quality shower room. ‘Burriana’ Nerja’s largest and most cosmopolitan beach is located directly below Capistrano some two kilometres. Located in a fertile plain surrounded by mountains Nerja can boast a spectacular Mountain backdrop! The centre of Nerja is a fifteen to twenty minutes stroll away. We also have a direct and regular local bus service which runs from Capistrano to the very centre of town and takes just five minutes. Integrated air conditioning units (A++) separately to both the bedroom and the lounge. This is a 'top of the Range' installation - there for your total comfort! Heating is provided by the two air conditioning units. All linen is provided with a full weekly changeover. All household towels are provided with a full weekly changeover. Beach / pool towels are NOT provided. Cafetier provided also a tea pot! We provide all the crockery and kitchen utensils you need and, we never forget the garlic press or the bottle opener!. BBC 1, 2, 3, 4. ITV 1, 2 ,3, 4. Channel 4. Channel 5. Sky Sports 1, 2, 3, 4. Eurosport, National Geographic. Discovery. Gold. Sky 1.Sky News. Sky Movies. True Movies 1, 2. Movies 24.,Universal. History plus many more! ther is a good selection of books in the property for your use and enjoyment. Full walled and private south-facing sunny garden with small flower borders around. South-facing shady terrace as part of the garden. There is a full tennis and ‘padel’ facility right alongside El Capistrano- just a short stroll away where you can Play for a very reasonable cost. There is also a restaurant and bar facility! The property is ‘front-line’ in as much as it fronts onto substantial ornamental lawns and trees. Below is the walkway alongside the road. Wheelchairs have been used happily but, we do insist that you contact us before reserving so that we may give you a frank and objective overview of precisely what you will encounter. The property and it’s terrace/ garden by the way, are all on one level with no inclines nor steps involved within. Flat Screen teletext television / DVD player with100+ channels featuring amongst MANY others, BBC 1, 2, 3 & 4, ITV 1, 2, 3 & 4,channel 4 & 5, Sky Sports 1, 2, 3 & 4,Eurosport, National Geographic, History, Discovery, Gold, Sky1, Sky News, Film 4, True movies 1 & 2, Sky Movies, TCM, Movies 24, Universal, 12 Radio Channels including BBC Radio, etc., etc., There is wireless internet access (WLAN) available both on-site in areas of Capistrano and locally at no charge!. Our American style kitchen includes a full oven with hob, fridge/freezer, microwave, toaster, plenty of cooking utensils and crockery. The property is complete with towels, linen (changed weekly), electrical fans, hairdryer, steam iron etc., maid service is provided between lets. There is a private walled garden with shaded terrace, patio table and chairs, sun loungers, (there is a set of patio doors to the garden from the lounge). The totally private garden is south-facing enjoying day-long sunshine. 'El Capistrano Village'is ideally situated for the town centre and the sea. 'Burriana', Nerja's largest and most cosmopolitan blue-flag beach is directly below. Here you will find every amenity you want to make your holiday experience memorable. Every kind of bar and restaurants line the beach where beach restaurants barbeque fresh meats, fish, shellfish and vegetables all day and late into the evening. Try one of their giant paellas cooked over an open fire! 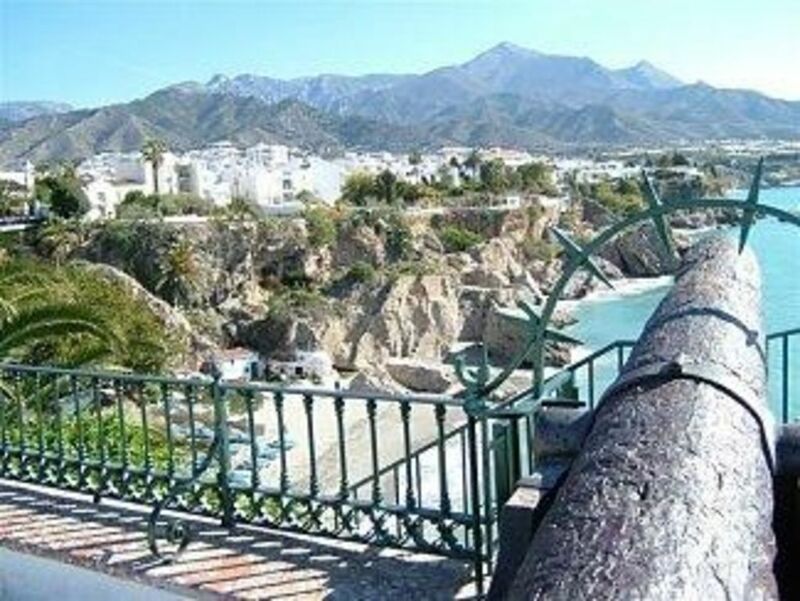 The 'Balcon de Europa',situated in the coastal heart of Nerja, is nearby. The whole area comes alive during the evening where (in summer months) the many restaurants spill out onto the streets when the area becomes traffic-free. Within walking distance from El Capistrano you will find the internationally recognised 'Caves of Nerja', a must see attraction. A short bus ride into the hills (10 minutes ride) is the white village of Frigiliana. Known as the 'village of three cultures' (Christian, Moorish & Jewish), take a camera ! Golf: A very short drive away in the town of Velez Malaga is the 'Baviera' Golf Course (close to the famous 'El Ingenio' shopping centre so, a big day out there if you fancy it! 'Baviera' is a full 18 hole course, well respected and competatively priced but, be aware, you will need your handicap documentation. The course is well tended and professionally run with a club-house which offers guest players and members alike every amenity. A fully recognised professional, motorised buggies, trollly carts and caddies - all there for your use. Ski: The well known Sierra Nevada slopes are but 2 hours drive away (no more) or, early some days (you would need to just check for full details) there is a bus from Nerja to the slopes inland with a reasonable and useable return-time bus. Basically, the bus runs in order to provide the facility for a days skiing for people from the Nerja area and so, it's designed and timed for you! The SIerra Nevada slopes are well and professionally run with options to suit every ability level. There are bars, restaurants, shops and all ski-lift facilities up there to ensure a faultless day of real fun!